If a Lapis Lazuli ring makes you think that stone is amazing, you are not the only one. Everybody has the same thought when they lay eyes on this mesmerizing gemstone. Lapis Lazuli is an opaque semi-precious gemstone that is famous for its strong royal blue color and the shimmering gold flecks which make you think of a starry night sky. This interesting gem has a very rich history and cultures such as the Greek and Egyptians were very fond of this semi-precious stone. Today, jewelers use Lapis Lazuli to craft luxury jewelry, such as a lapis lazuli ring. In this article, you will discover more about the Lapis Lazuli stone, its rich history and how it became so popular. Lapis Lazuli is a deep blue metamorphic gemstone and people love its intense color. The oldest evidence of Lapis Lazuli dates all the way back to more than 6500 years ago. Archeologists have discovered evidence of the Lapis Lazuli gemstone among the treasures and furnishings of ancient graves. This semi-precious gemstone appeared not only on jewelry. It was part of different objects, including bowls, figures, hair combs, decorative objects and dagger handles. Lapis Lazuli was very popular throughout ancient civilizations such as Greece, China, Rome, Egypt, and Mesopotamia. Lapis Lazuli was also an ingredient in medical elixirs and eye-shadow using grounded powder. But this semi-precious stone was used by famous people in their work. For example, the famous Italian sculptor and painter Michelangelo used the beautiful color of the Lapis Lazuli stone to produce ultramarine color pigments which he used in some of his paintings. Some people say that this gemstone was one of the first gemstones ever crafted as jewelry. The semi-precious stone was fashioned into beads and cabochons. The name of this semi-precious stone is derived from the word “lapis” which in Latin means stone. That is why many people and jewelers today refer to this gemstone as “lapis”. The mineral makeup of this gemstone consists mainly of Lazurite and some other materials. White Calcite and Pyrite are responsible for those mesmerizing golden flecks within the stone. Historians believe that Lapis Lazuli originated in the Sar-I Sang mines, which are in the northeastern part of Afghanistan. Today, the mines in Afghanistan continue to provide a great part of the gemstones present on the market, but other mines from Russia, Pakistan, and Chile have an important role as well. You can also find Lapis Lazuli stone in other countries, such as the US and Canada, but in small fragments only. You can find many valuable Lapis Lazuli rose gold rings, or earrings on the market today. The most precious form of this semi-precious stone is the one with a deep intense blue color and evenly pyrites. All the stones that have a blotchy appearance or simply have a lighter color blue, are worth much less. In addition to this, if the gemstone has excess quantities of pyrite or calcite its price will lower considerably. Even so, this semi-precious gemstone is as popular today, just as during the ancient times. Today, Lapis lazuli is frequently used to craft jewelry and other fashion items. Some of this jewelry are real pieces of art while others are simply decorative. You can easily find a Lapis Lazuli necklace or a rose gold pinky ring in the select jewelry shops at a very reasonable price. However, in the past, because of all the myths and symbolism surrounding this gemstone, it would have been next to impossible to get your hands on a Lapis Lazuli. Of course, unless you were a king, a pharaoh, or very powerful nobleman. For example, the myth of the Sumerian goddess of love, Inanna, presents her to enter the underworld wearing a Lapis Lazuli necklace and a rod. It is believed that Lapis Lazuli contains the “soul of a deity” and that will bring happiness to the wearer. This semi-precious gemstone appeared not only in myths and stories but was also used in important documents. People used cylinder seals of Lapis Lazuli to mark official documents and religious inscriptions. Today, Lapis Lazuli is a very popular semi-precious gemstone. That is why more and more jewelers have integrated this stone into their work. If you don’t have any jewelry with this gemstone yet, you should purchase a lapis lazuli ring, pinky ring or a lapis lazuli necklace. You will see that most of the lapis lazuli jewelry is either gold or gold plated. 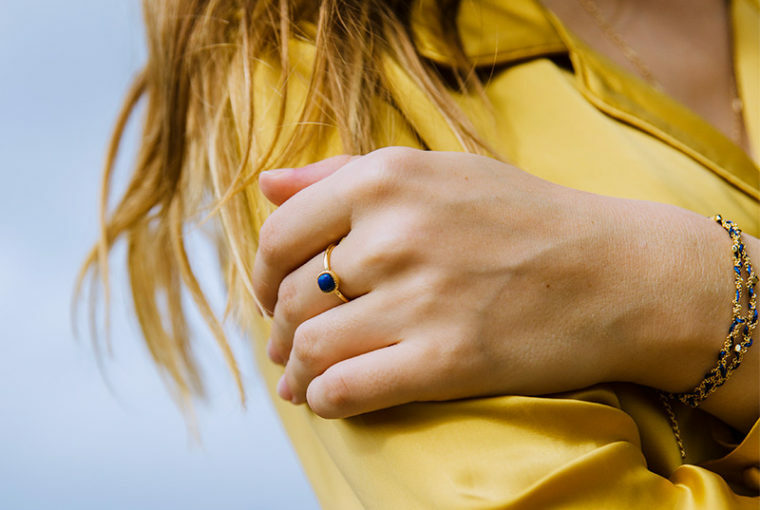 This happens because the color of the gold ring will contrast the color of the Lapis Lazuli gemstone. 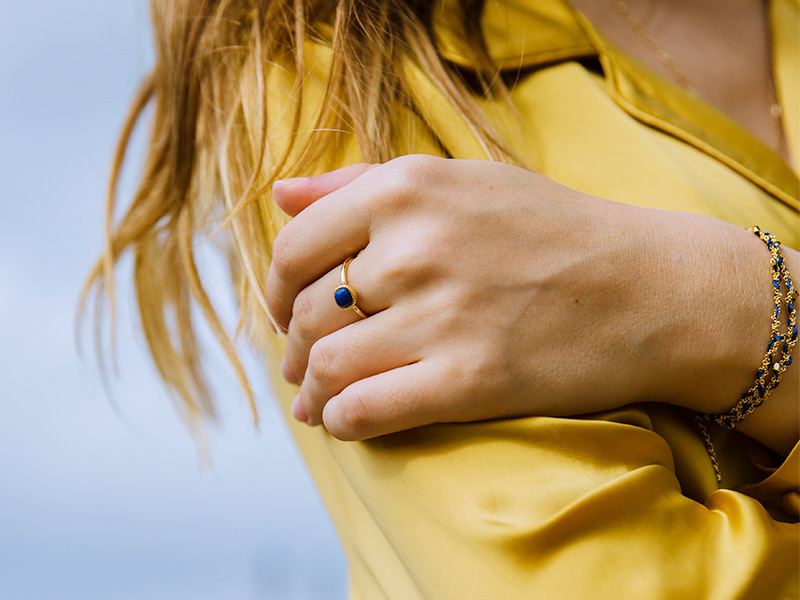 See our unique Lapis Lazuli ring from our designer rings collections and visit our shop for more limited edition fine jewelry. To get more jewelry information, read our other articles as well.